When it comes to choosing the right pallets for your company, you have many options besides standard wood pallets. 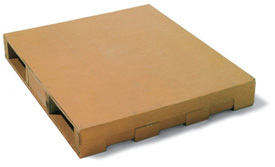 Millwood provides many alternative material pallet options, including corrugated pallets. Specific application needs and strength requirements mean companies need corrugated pallets designed with a science-based approach. Millwood analyzes load-handling methods, storage and transportation before offering a recommendation on alternative material pallets. Our corrugated pallets are also designed to be cleaner than traditional wood pallets.